Brussels sprouts. Just the name gives kids the willies. And carrots are too often relegated to side-kick status as part of some veggie medley. As a kid, I hated them, too. But this dynamic duo deserves better than the contempt of millions of kids. The problem with this pair is that they are so often steamed – or worse, boiled – into oblivion. But Brussels sprouts and carrots are full of untapped flavor potential, sweet and savory, that needs some high heat to release. Water boils at 212º and steam can’t get much hotter than that, and baby, that ain’t enough for these tough guys. You need to crank up the heat to 400º to get the caramel-y sweetness to reveal itself! And when it does, what you get will astound you. Our first dinner guest of 2012 got these Brussels sprouts, along with my Pumpkin & Mushroom Risotto and my Orange-Thyme Honey-Mustard Pork Loin. 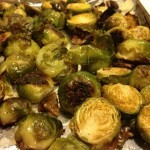 He rather meekly admitted he didn’t care for Brussles sprouts, but being a courteous guest, he gamely tried them. Guess what? He loved these sprouts! Give these to your kids and break the ugly cycle of veggie hostility and give this dynamic duo their due! Hey – I put the timing for that whole meal at the end of the Pork Loin recipe to tell you when to do what in order for the whole shebang to be ready at the appointed time. Head here for the details. Rinse, clean and peel the carrots. Trim the tops and tips, then cut them in lengthwise into long, thin quarters. those thin plastic bags you bring your produce home from the market make great receptacle for veggie peelings. 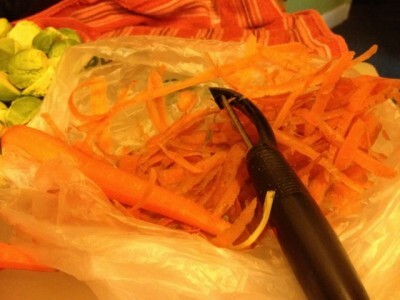 Just peel the carrots (or potatoes or whatever) right into the bag and toss in the trash! Rinse the sprouts and pat dry with a kitchen towel. 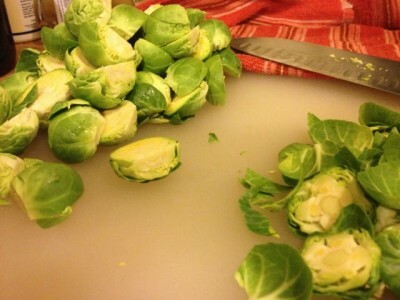 Trim the little stem ends and cut the sprouts in half vertically, discarding the outer leaves that come off. 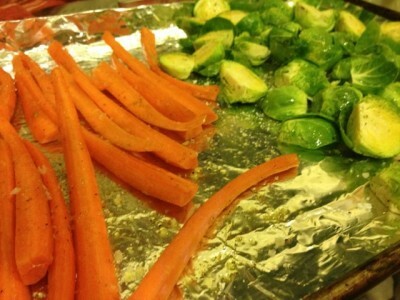 Line a 17 1/2 x 13 inch baking sheet with foil [if your baking sheets are too small, use one for carrots and one for the sprouts.] 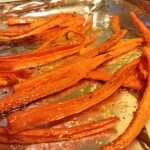 Put the carrots on one side of a baking sheet (line it with foil for easy-peezy cleanup). Drizzle them with about 2 tbsp olive oil and toss to coat. Spread them out in one even layer. Wash your oily hands! Season liberally with salt and pepper. 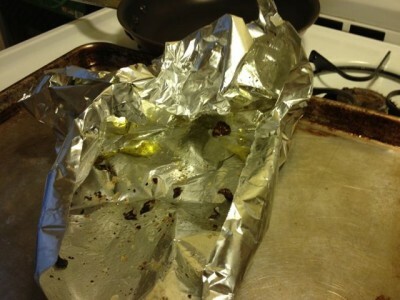 Do the same with the Brussels sprouts on the other side of the sheet. 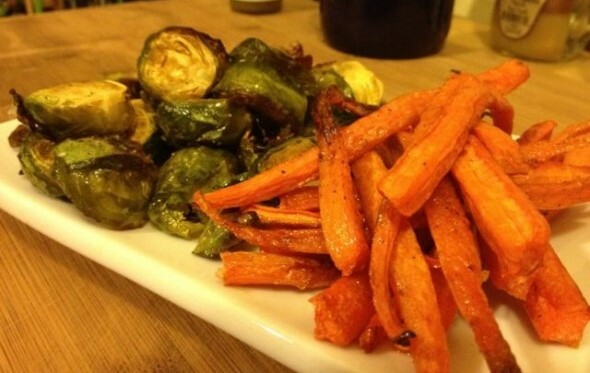 Don’t mix the carrots and Brussels sprouts together, because the carrots are going to be in for a tad bit longer. Roast everything at 400º for 20-23 minutes when the sprouts should be done – the loose leaves will be very dark and the sprouts will have bits of nice caramel-y color. Scoop them off and put the carrots back in for another 5-8 minutes until the tips begin to caramelize and the carrots are cooked through. Wad up the foil and enjoy these mis-understood veggies in a whole new way – your kids’ll love ‘em!